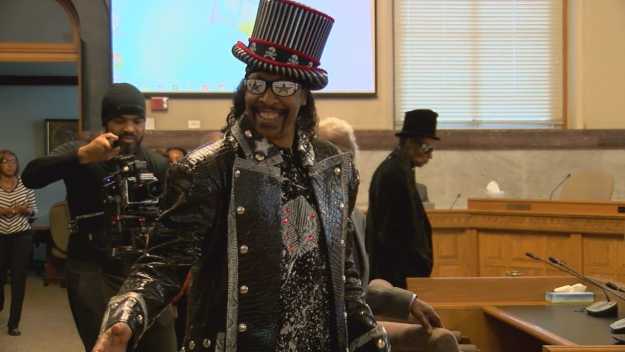 Funk musician Bootsy Collins and Cincinnati city leaders are fighting to keep a piece of music history from being torn down. The Rock and Roll Hall of Famer was at City Hall Tuesday where he talked pushed to save legendary King Records in Evanston on Bewster Street. "We have an opportunity here to not just save a building, but to save a historical piece of our identity," Collins said. The hope is to preserve the old record studio side of the building. In its heyday, the studio provided recordings sessions for Redd Foxx, Collins, Hank Ballard and James Brown. "It took a lot of people off the street and combined people together that wouldn't normally be together or do nothing together," Collins said. City council passed a resolution Tuesday declaring the intent to appropriate the old King Records property. "It was like Motown, it was like Stax, it was like Sun Records. I mean all of those things we had our own. We got our own history right here and to throw that away, it's just like throwing a baby out with the wash," Collins said. Supporters hope to renovate the property which would house a music library where people could experience the collection of music that was created there. "What this resolution does though is declares King Records a public purpose for the benefit of eventually starting imminent domain proceeding in the event that a deal doesn't happen," said Yvette Simpson, council member. The hope is that some type of agreement can be made with the building's owner, who at at one point called for the building to be partially demolished to expand business.